The German-born architect Thomas Rau worked for some years at the Alberts & Van Huut practice, after which he designed several ‘organic’ local branches for the ING Bank and the Triodos bank building in Zeist. 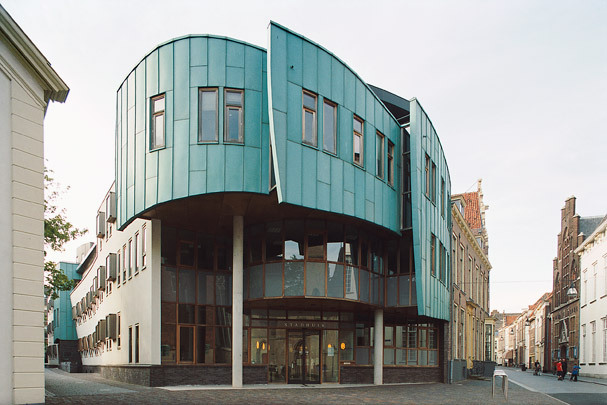 In Zutphen town hall, this organic architecture is expressed as undulating facades of patinated copper and white rendering, a fine focus on sustainable building and a heavyweight programme inserted with great care into the historic town centre. The set-back upper storeys prevent the volume from having an overly monolithic effect. The building had to express a new administrative tack, which it does mainly through the tall central hall with its remarkably shaped steel structure.